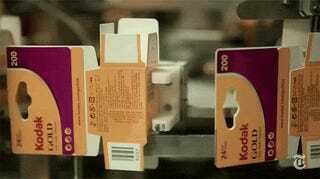 The decline of Kodak as a powerhouse of photography is a story oft told. But what does it actually look like in the facilities that once churned out endless rolls of film for the masses? This New York Times video shows what has become of Eastman Kodak's business, and it might be a bit of a surprise. Film still plays a part in what Kodak does at its headquarters in Rochester, New York—just on a much smaller scale than the decades before the digital revolution. After declaring bankruptcy in 2012, Kodak had to face many changes, not just decreased film production. Much of its factory space is now used by other companies manufacturing and packaging products completely unrelated to photography—like salsa! But Kodak still has its hands in many areas of the photographic world, from motion picture film, to high-end inkjet printing. That doesn't make it any less melancholic seeing a giant of photographic innovation struggling to survive.